Home / Beauty • Chia Seeds • DIY • Emollient Oil • Healthy Skin • Kiwifruit Seed Oil • Rosehip Seed Oil • Tamanu Oil / Fight Aging Skin with Kiwi Fruit Seed Oil (This One Ingredient Makes a Lot of Difference)! 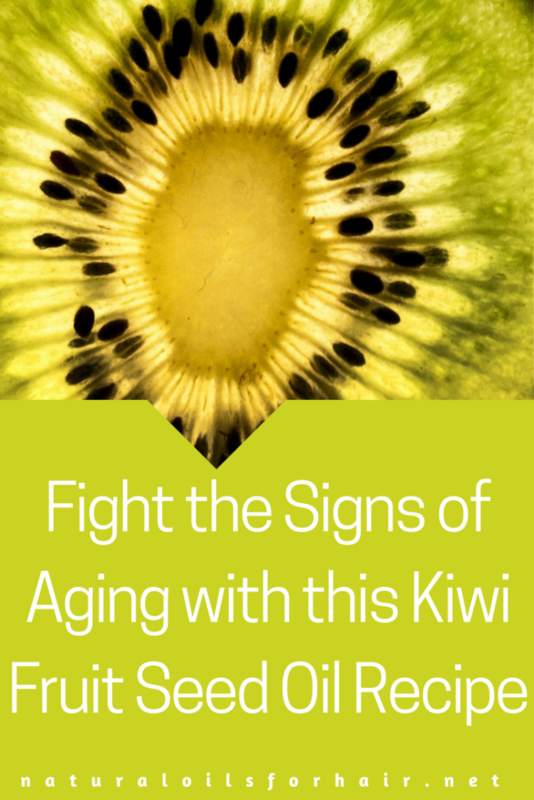 Fight Aging Skin with Kiwi Fruit Seed Oil (This One Ingredient Makes a Lot of Difference)! The kiwi fruit aka Chinese gooseberry is native to China. It spread to New Zealand and parts of Europe over the centuries. The fruit is soft and sweet with rows of tiny black seeds located in the centre. The seeds are edible and safe to consume. The kiwi fruit oil is extracted from these tiny black seeds. The oil contains up to 62% essential fatty acids of alpha linolenic acid (omega-3), which our body is unable to produce; thus making it one of the best oils to use when it comes to reducing age progression on skin. It is an ideal oil equally suited for hair and skin care, and is especially useful as an anti-aging product. The high concentration of omega-3 helps to maintain moisture in the skin and keep it supple. Kiwi fruit is 100% fat-free with a glycemic index of 52 making it a welcome addition to any fitness regimen and safe for diabetics. Kiwi fruit also contains the phytochemical, lutein, which protects the eyes from a variety of ailments and macular damage. In addition to above, kiwi fruit seed oil is also packed with vitamin C (more than an orange), vitamin K, vitamin E, copper, potassium, manganese and folate. A light 5% inclusion of kiwifruit seed oil in your regimen is excellent for softening and soothing the skin as well as enhancing absorption of your product. 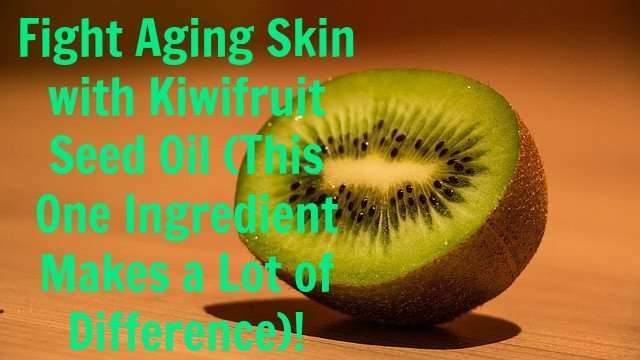 You can add kiwi fruit seed oil to your skin care products especially products for the face and neck. Apply it undiluted to your face and neck 2 – 3 times a week after cleansing. You can also apply it to your body and face after a sun tanning session to treat sunburn or protect the skin in general. Include kiwi fruit seed oil in your healthy salad dishes. It will brighten up the dish and promote your health as well. In addition to vitamins, it’s a good source of dietary fiber useful for reducing cholesterol levels and eliminating toxins from the body. You can read about the nutritional breakdown of kiwifruit HERE. You can also view various kiwi fruit food and drink recipes HERE. Invest in an excellent skin care product based on kiwi fruit seed oil. 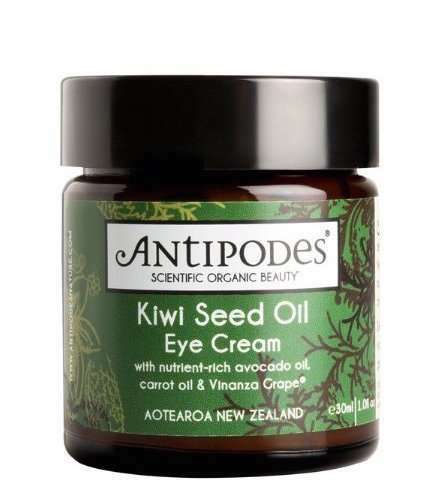 The Antipodes line comes highly recommended. Caution: Kiwi fruit contains oxalates, which can cause problems if they become too concentrated in body fluids. If you have any kidney or gall badder problems, it’s best to avoid kiwi fruit. Some alternative oils for similar skin care issues include chia seed oil, tamanu oil and rosehip seed oil. The next article will examine the benefits of kiwi fruit seed oil for hair and the best way to use it on hair.